The seven .NET-based WCM vendors Real Story Group evaluated in our Web Content & Experience Management Report have all enjoyed a reasonably strong decade. They've each innovated in their own way and built up channel networks, but also have benefited heavily from Microsoft's abdication of this space. Yet, there's one glaring weakness that limits them among the larger enterprise customers they all covet. With the exception of Umbraco and perhaps Ingeniux, these vendors have engaged in a kind of feature-by-feature arms race, competing to see how many engagement services they can cram into a single codebase. Want surveys, polls, and job boards? Got that. Crazy enough to think that you could invoke four different types of personalization? Sitecore gives you that — and the others are trying to catch up. This engagement platform-in-a-box architecture works well for mid-sized organizations or larger enterprises with more modest needs. I just got off the phone with a Fortune 500 RSG subscriber looking at some these tools who falls into the latter category, and happily I was able to confirm they had pulled the right short list. 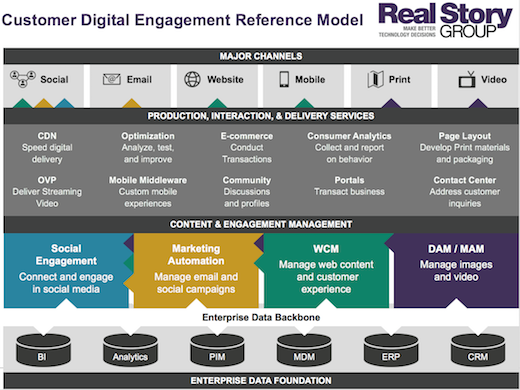 Where this approach starts to fall apart is when an enterprise has a more multidimensional digital engagement architecture, where the WCM component necessarily plays a more modest role. We see this primarily in larger enterprises, but not exclusively; some mid-sized organizations are getting savvier about setting clearer boundaries. WCM is just one piece of the bigger customer engagement puzzle. Important? Yes. Predominant? Maybe not. "Headless" deployments certainly play a role here. But more generally, a well-behaved WCM platform in this environment also doesn't try to arrogate services from other key components in the colorful "engagement" tier in the image above. This is where Sitecore, Episerver, and Sitefinity in particular tend to offer too much. Their channel partners are experimenting with stripped down implementations of these tools. But the vendors themselves — having built massive feature arsenals — don't seem too interested in arms control. Besides, on what basis would they then charge a premium? First, to the extent possible, don't narrow your choices based on technology. With each passing year I see Java vs. .NET vs. PHP et. al. factor less and less into business technology decisions, and that's a good thing. Yet technology base still matters to some extent, including in this cloud era where it might concern you mightily whether your system will live in Azure vs. AWS. If you do want to go the .NET route, get clear about what role WCM services will place in your broader digital engagement architecture, then align technology and cost accordingly. Our hard-hitting WCM research can certainly give you the inside scoop. If you're already a subscriber, don't hesitate to reach out to explore how RSG can help you achieve greater success. "This excellent research has saved weeks of work reviewing the marketplace to enable a tender to be sent out to just a handful of potential vendors in record time. Well done."